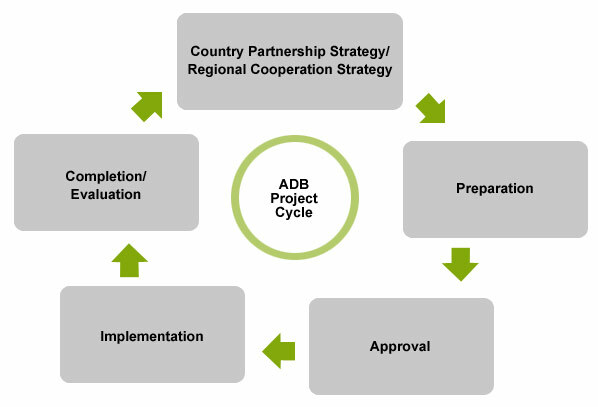 ADB projects go through various stages, collectively known as the ADB project cycle. The stages of the project cycle provide various opportunities for individuals and companies. Each country partnership strategy outlines the overall approach to ADB's work in the country. ADB often engages consultants to help conduct thematic and sector analyses and assessment studies in preparation for a new country partnership strategy. Preparatory work includes poverty and social analysis reports, and if the project requires resettlement of people or might adversely impact the environment, or indigenous peoples, certain safeguard assessments are prepared, often with the help of consultants. During project examination, ADB undertakes feasibility studies that involve hiring consultants to work closely with the government, civil society, affected people, and others to assess project risks. Consultants are recruited to assist the government to implement the project. It is during this time that procurement takes place. For example, in an infrastructure project, detailed engineering design and bidding documents are prepared, and machinery and equipment are procured. At this stage, evaluation studies are conducted with the assistance of consultants to assess the effectiveness of the project. All of these business opportunities are listed in ADB’s projects and tenders section.